Germany’s Benjamin Werndl threw his hat into the ring for a place at the FEI Dressage World Cup™ Final next April when producing a spectacular victory with Daily Mirror at the fifth leg of the 2018/2019 Western European League in Salzburg, Austria. The pair’s performance wasn’t perfect, with a few glitches along the way, but the best bits weren’t just good - they were breath-taking. And with only three riders from each nation allowed into the Final, Werndl is putting intense pressure on his German counterparts for one of those slots after moving to the top of the leaderboard alongside compatriot Dorothee Schneider. It was Sweden’s Patrik Kittel who lined up second with Delatio while Schneider slotted into third with Faustus on a day when all the leading partnerships really stepped it up to another level. In the weekend’s FEI Vaulting World Cup™ in Salzburg, Nadja Büttiker of Switzerland, Lorenzo Lupacchini of Italy and duo Torben Jacobs & Theresa-Sophie Bresch of Germany took the top spots. Werndl was 11th to go of the 15 starters, and when his test kicked off with a double-pirouette followed by two-tempi changes and another double-pirouette on the centre line then it was obvious he meant business. Daily Mirror’s ground-eating extended walk earned a 9 from four of the five judges as the daring duo marched to the first over-80% score of 80.790. And then he had to sit back and watch four more formidable contenders as he looked to add to his victory in Saturday's Grand Prix. Australia’s Kristy Oatley and Du Soleil posted 79.330 before Kittel and his new ride Delatio, which was competed by Great Britain’s Emile Faurie until July of this year and was runner-up for the Swede on their World Cup debut in Lyon last month, put 80.010 on the board to slot into second spot. And that’s where they would remain despite a lovely performance from European and World team gold medallist Schneider and her super-exciting “Grand Prix baby” - the 10-year-old gelding Faustus who scored 79.730 for third place. Now that he has the FEI Dressage World Cup™ Final 2019 in his sights, Benny Werndl really wants to get there, but he knows the battle for one of the German slots is not yet over. His sister Jessica von Bredow-Werndl is among the stars he must overcome! “All the other ladies want to go there too, but at least now I have a good chance, and I’m hoping to get to another qualifier in either Amsterdam or Neumünster in the new year,” he said. As for Daily Mirror, he said: "This horse is a gift…I’m having an unbelievable trip with him, he’s developed so much over the last few months and I can’t find the right words to describe how much it means to me!" Competition for the FEI Vaulting World Cup™ got a little hotter this weekend as leg 2 of 5 filled the stands of the Messezentrum arena. Vying to see who will qualify to go to the finals in Saumur, France, next April, vaulters competed in three different categories, giving stunning and often risky performances on horseback. In the Individual Female category, Swiss Büttiker, who also won Leg 1 in Paris, took first place, with her time-themed routine that included very fast, beautifully finished moves with a high degree of difficulty. Second place was awarded to Marina Mohar, also of Switzerland. Third place went to German vaulter Corinna Knauf. Lupacchini of Italy took gold in the Individual Male competition. Lupacchini, who along with Sylvia Stopazzini is one half of the reigning world Pas de Deux champion team, has also been climbing the ranks as an individual vaulter and wowed the judges with a charismatic and athletic performance based on Charlie Chaplin. Lukas Heppler of Switzerland took second place in the Individual Male category, with third place going to Juan Martin Clavijo of Colombia. Heppler won first in his group in Paris and will certainly be giving Lupacchini a run for his money on the road to the finals, although the young Colombian vaulter can’t be counted out. Three pairs competed in the Pas de Deux Vaulting competition, with first place going to Jacobs and Bresch of Germany. Second place was awarded to the American team of Haley Smith and Daniel Janes, with third going to Heike Hulla and Yvonne Oettl of Austria. Sylvia Stopazzini took a bad fall on Friday, injuring her knee, which took her out of Individual competition and the Stopazzini-Lupacchini pair out of Pas de Deux contention on Saturday in Salzburg. The Vaulting world wishes her a speedy recovery and anxiously awaits her return with her partner on the Pas de Deux circuit. Want to see who carries the day at the next legs in Leipzig and Offenburg? 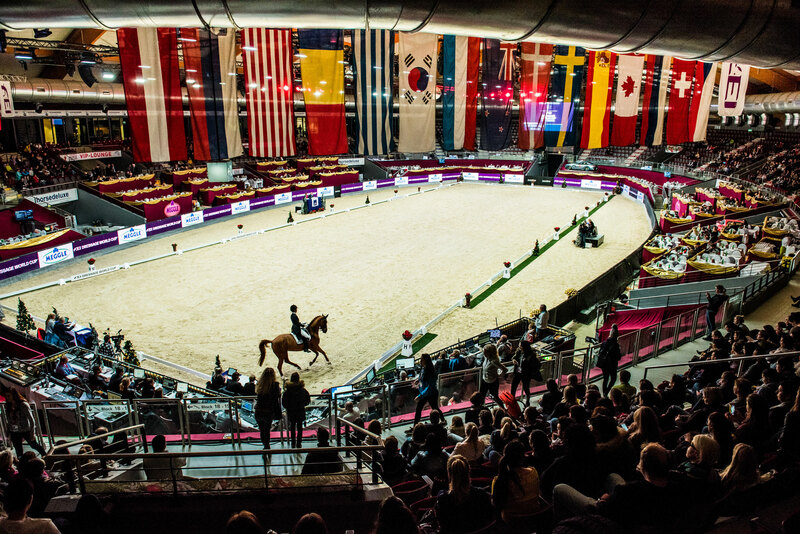 Catch all the FEI Vaulting World Cup™ action on FEI TV.